Hot soup on a cold night warms the soul—make some kimchee ramen for dinner. The soup is eponymous of the type of Japanese wheat noodle. But the key to making this soup starts with a rich, thick stock; and of course some solid Napa cabbage kimchee (baechu). 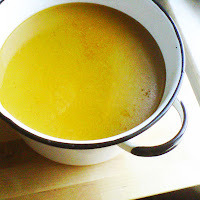 The difference between stock and broth is that stock is made with bones and skin and requires long slow simmering. Broth is made from meat or vegetables. Here’s a good use for the massive remains of your Thanksgiving turkey—make your own golden, thick, rich soup stock. This beats the store bought variety any day. After long simmering and cooling I can literally stand a fork in my stock. It’s not hard to make but it’s one of those things you do if you’re home all day. You’ll need some equipment: 2 large stock pots; one for cooking and one for straining the liquid. You’ll also need something else to do for about five or six hours (i.e. organize your Netflix cue, paint the bathroom). You’ll also need some vegetables for flavor. I make soup stock often so I keep a bag of vegetables scraps in the freezer with most everything except for potatoes. Heat olive oil in a large stock pot and add chopped celery, carrots, onion, bay leaves, pepper corns and salt. Cook until the celery is wilted. Cut turkey body into smaller pieces (quarter sections). Add this and the other leftover turkey parts to the stock pot. Now add enough water until it sits about 3" below the rim of the pot. Turn up the heat and bring the pot to a boil (it takes about an hour for something this size). Cover and boil for about 10 minutes and then lower heat to simmer. Now here’s the part where you start painting the bathroom or watch The Lord of the Rings: The Return of the King (extended Blu-ray cut). Simmer your stock for about four hours... yes, FOUR whole hours... stirring occasionally with a long wooden spoon. Remove from heat and allow to cool a bit, or you can live dangerously and strain hot. Joking aside, hot liquid strains more efficiently than cooler liquid, but be careful and do wear some protective gear. Place a colander over the second large pot and carefully strain the contents of the first stock pot. Discard all the solids. Rinse out the the first pot and place a wire mesh sieve lined with cheese cloth over the top. Sieve the liquid from into the first pot and discard the cheese cloth. Return the pot to the range. Simmer uncovered until about 1/3 of the liquid remains. This should take another hour... so organize your Netflix cue. Cool, then pour your stock into a container and refrigerate over night. Your stock should be as thick as gelatin. This makes it easier to use. You can also freeze your stock into serving size containers for future meals, but leave an inch of air space to prevent contents from expanding. Refrigerate your stock over night before using. It will be as thick as gelatin. Great idea Tony! I guess you could add a bunch of the vegetable scraps saved from preparing the thnksgiving dinner and make it a truly 'leftovers' creation. You celebrate Thanksgiving in Australia? I have the long and short method for kimchee ramen, One of the will make it to the blog.